Rutland Riding Club was started in 1968 by Mr. Heinz Franz, who had a livery yard and riding school in Ashwell. He held a dressage competition in his very small, sand arena, which was judged by Dame Mary Colvin D.B.E., T.D. a List 1 dressage judge, who lived at North Luffenham. A committee was subsequently formed with Mr. Tom Fraser as Chairman and Cathy Gresham as secretary, a post she held for many years, she became an honorary member, though, sadly, she is no longer with us. Dame Mary was a great supporter of the Riding Club movement, part of the British Horse Society. She became our Chairman in 1970 and generously gave the Club much of her time, allowing us to use her private indoor school for training clinics and arranging for top class instructors. It was at her home that a young man called Richard Davison came to take a clinic, the first of many, as he continued to do clinics for us because we were one of the first clubs he came to. She also encouraged us to organise an affiliated Dressage competition, this first ran at Melton Mowbray in 1982, moved to Lilford Park, near Oundle, where it ran as a two day event with classes up to Prix St.George and then to the Rugby Ground at Oakham, only finishing when most affiliated riders wished to ride on a surface rather than grass. The Club has never had just one base, but “The Wharf” at Market Overton, where Mrs. Janet Sturrock F.B.H.S. had a highly acclaimed yard, training students for all equestrian exams, was a regular venue. We were made very welcome, appreciating the indoor school for flat work and show jumping and the cross- country field for both training and competitions. Many Rutland members benefited from “guinea pig” sessions, being taught by the students under the watchful eye of Mrs.“S”. Another regular venue at this time was at Manton where Mrs. Burnaby- Atkins kindly allowed us the use of her outdoor arena and the fields with show jumps and a cross-country course. It was here that we ran the first of several successful “Open Shows”. The next Chairman of the Club was Mrs. Janet Worth. She joined the committee and was secretary for many years, also organising the affiliated dressage competition with great efficiency, before taking over the Chairmanship when Dame Mary retired. The Club has always enthusiastically taken part in Riding Club Area competitions, Dame Mary competed in dressage teams and Mrs. S. competed in as many disciplines as she could, and for which she was eligible, well after most of us have hung up our spurs!! There have been many successes at the Championships, in the early years we had teams competing at Dressage, Prix Caprilli (Riding Tests with small jumps), Show Jumping, Equitation Jumping and Horse Trials. 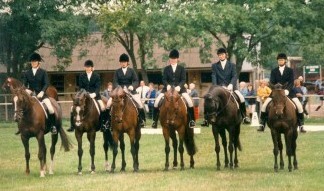 We had a win in the Pairs for Mrs. S. and Deirdre Haynes in 1993 with another in 1995 when the Rural Riders Team won. This involves six riders doing a set dressage test, with a caller, the team consisted of Janet Sturrock, Deirdre Haynes, Pat Brown, Heather Sandel, Joanna Holmes (Cole) and Carol McCarthy with Rosemary David as caller. In more recent years Suzi Dawe gained the highest percentage dressage mark by winning at Elementary level, Rachel Hanlon did similar the next year at Preliminary and the following year Danielle Jackson won the Open Intermediate Horse Trials Championship and was third individual in the Open. The Club has been represented at several Championships, both Summer and Winter, over recent years, at Lincoln with Riding Test teams and Dressage individuals and twice with Dressage Teams at Hartpury. Tamsyn Iveson has been highly placed at both Hartpury and Lincoln. Let us hope there will be many more successes in the future.